Input fields allow users to enter and interact with data. Often used with form layout, but can exist outside of a standard form. Label: Description of text field. Help Text: Context to what the user should do with text field. Placeholder Text: Example text within the text field. Input Field: Contain to accept text, numbers, or combination of both. Use a label that is meaningful, clear, and concise. Use basic help text, do not hide it. Use placeholder text that’s formatted as an example, not as a label. Use sentence case and avoid all uppercase. Use the proper input length as an affordance to how much content can be entered. Use the proper input type in HTML based on the data being collected. e.g., type='email' for email, type='number' for numeric values, type='text' for general text. Placeholder text appears inside of an input field. This text can serve as an example of what the user could enter. When a user enters data into an input field the placeholder text should disappear. Placeholder text is not accessible to all users and should not be used to provide instruction or be required to use an input field. The input allows users to enter text, numbers, or a combination of both as information to submit. Validation and errors help the user understand what is incorrect in an input field. 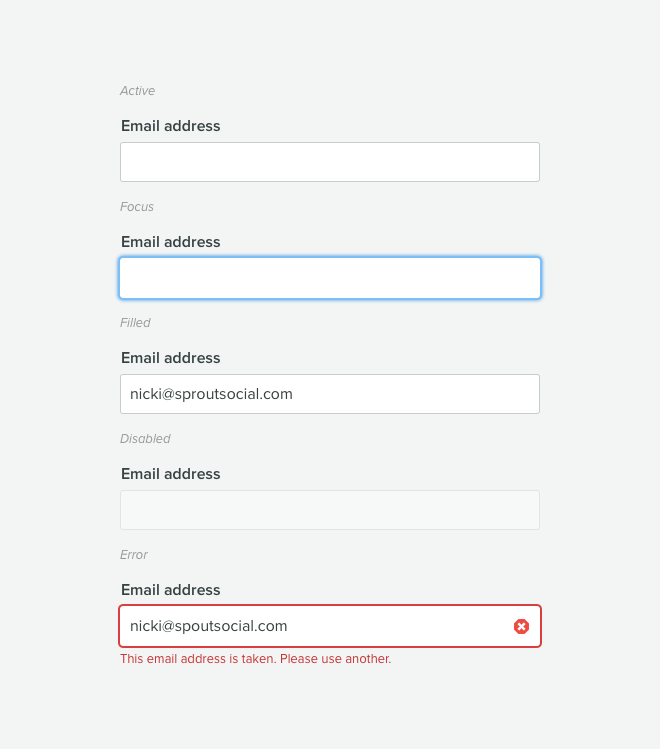 Validation should happen after the user fills out the field.